Don and Chris, two members of the group that built Sea Shadow, Canada’s St Ayles skiff have teamed up to build a pair of 16′ Amberjack dories. These boats, designed by Iain Oughtred, are a smaller and lighter version of his very successful 18′ John Dory. Both are Swampscott – more stylish and finer-lined than the Banks dories. Their rounded sides and narrow flat bottoms offer excellent performance and handling qualities plus exceptional seaworthiness. 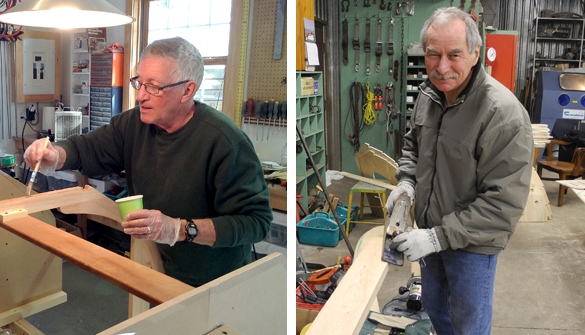 Two guys, two dories and two workshops. Building begins in Don’s shop making the component parts – stems, transoms, frames and moulds. Next it’s over to Chris’s shop to set everything up and plank the hulls. One hull will stay in my shop (Chris’s) and the other goes to Don’s for completion – gunnels, seat risers, thwarts and finishing. Great looking boats guys! I myself am just about to start building a boat, the R13 by Bateau, and oars as well. What oar plans did you use?